Lovesticks - Sunflower - 12oz. We recommend for the freshest bread and to secure a faster delivery date to pay for second day air because USPS and UPS can take up to a week to deliver depending on your location. The Lovesicks are protected in a sealed plastic bag. The shelf life of this perishable item is ideally one week from shipping date. If you prefer to pay for second day air call us at 1 (800) 457-6213 and leave us a message for the best time to return your call. VEGAN, SOFT, UNIQUE & HANDMADE WITH LOVE. 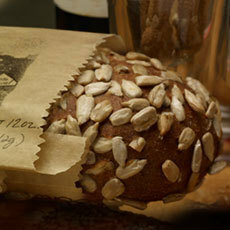 INGREDIENTS: Organic Whole Wheat Flour, Organic Wheat Flour, Barley Malt, Olive Oil, Sea Salt, Yeast, Rolled in Sunflower Seeds.